If you need a high score on the IELTS (International English Language Testing System) for admission to a U.S. university, you want to be as prepared as possible and take the test with confidence! 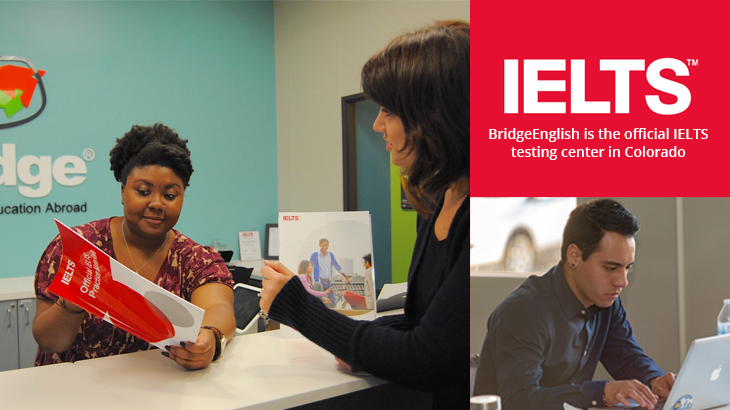 As the official IELTS Testing Center in Denver, Bridge has the experience to help students prepare for success on this important exam. In fact, we are the 4th largest IELTS testing center in the United States! Now we offer even more ways for students to prepare with our IELTS Power Prep Courses. Choose from the following options, or bundle all 3 to maximize your learning and save. This is 100% online practice you can do at your convenience, anywhere and anytime. Our most popular option, this is a single, marked IELTS mock exam. Learn in person with our on-site, one-day IELTS power prep course at our Bridge center in downtown Denver, Colorado. Ready to get serious about preparing for the IELTS? You can bundle all 3 Power Prep options for the full program and save 10%. To learn more about IELTS Power Prep, click here.